Their direction never changed. They were always moving forward and down. On the inrun, they folded their chests against their quads. When the track curved, they compressed like springs. At the edge of the table, when the ramp flattened, they pushed, driving, leaning out. Their skis opened to a V, thin extended wings. Their bodies stretched and were still. They were like kites caught in the air. The quieter they stayed, the farther they flew. They were falling at every moment, speeding toward the declining ground. They floated, and then sank downward. They were always men, until now. 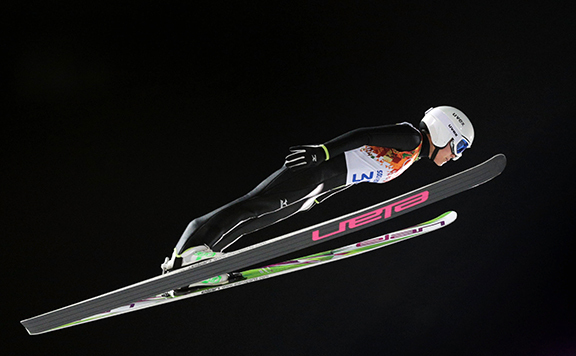 Lindsey Van might have been the first woman to win an Olympic gold medal in ski jumping. In 2010, she might have held her own even if she had competed against the guys. She set the hill record in Vancouver, after all, gender be damned. Ski jumping favors light bodies, and women are light. Van was strong and skilled and determined. But women were not allowed to ski jump. Van’s efforts, and the efforts of some of her teammates, were among the biggest reasons women were able to jump in Sochi yesterday. She helped lead the fight for inclusion. That pressure forced the International Olympic Committee to reverse course — part of the way, at least: Women could compete in one event, the normal hill, while men competed in three. But by the time Van finally had her chance to compete at the Olympics, she was 29. Of the 30 female ski jumpers, half were teenagers. Van had injured her ankles and her knees. She had ruptured her spleen and broken six vertebrae. She also had injuries, half-healed, you couldn’t see, the wear and tear of her life. She had spent years training and competing without enough money, sleeping in hostels, sharing equipment, and holding fundraisers. She was bruised from the long fight for inclusion — the lawsuit against the Vancouver Olympics organizing committee, the countless interviews, the uplifts of hope, the disappointments. “It just makes me nauseous,” she told NBC. “Like, I kind of want to vomit. Like, really?” After all, she added, her uterus is protected by her body. Unlike men’s balls. The competition had gotten better — had gotten, in fact, very good. And she had gotten older, past her prime. She was going to be the one magazines profiled and commercials featured. She was going to be a star. And because she would win, she would make Americans pay attention in prime time to ski jumping not as a cause but as a sport. But training in August, in Oberstdorf, Germany, she outjumped the hill. She flew 148 meters — 485 feet, or nearly a tenth of a mile. It was too far. The hill at that point was flat instead of the gentle downslope smooth landings demand. She tore her ACL and MCL and damaged her meniscus. Instead of taking the time to heal, she took the only time she had. She started jumping again in January, less than five months after injuring her knee. Despite missing the Olympic trials, despite missing every World Cup event, she was given a spot on the Olympic team. Sara Takanashi of Japan might have been the first. She was the favorite, by far. So far this season, she had won 10 of 13 World Cup events. “Sara’s gold-medal chance is 100 percent,” said Masahiko Harada, who had won a gold in ski jumping in Nagano. “Haven’t you seen her jump? It can be 500 percent.” When you see her jump, you understand. She is a paper airplane. Even her hands seem like the small upturned tips of glider wings. She is so small, barely 5-foot, and so young, only 17. Her chin peeks out beneath her helmet and goggles and makes her look like a child. When she wedged her skis to slow her speed after landing, she reminded me of the swarms of kids you see in ski school, wearing bright snowsuits, zooming around without poles. But in the air, she looks ageless. And for months, she had been bearing the intense pressure incredibly well. During her first day of training jumps, she was flying so far, she reached down with her skis for the ground. In Japan, ski jumping is a premier sport. Takanashi’s hometown, Kamikawa, planned fireworks to celebrate her win. The town’s shops hung banners and pink flags that said “SARA.” The mayor of Kamikawa made the trip to Sochi to see Takanashi on top of the podium. Daniela Iraschko-Stolz of Austria might have been the first. She is 30, even older than Van, but unlike Van she has been jumping phenomenally. In Sochi, she was winning training rounds and establishing herself as Takanashi’s main, and it seemed only, challenger. Before the competition, Iraschko-Stolz was getting attention for another reason as well. 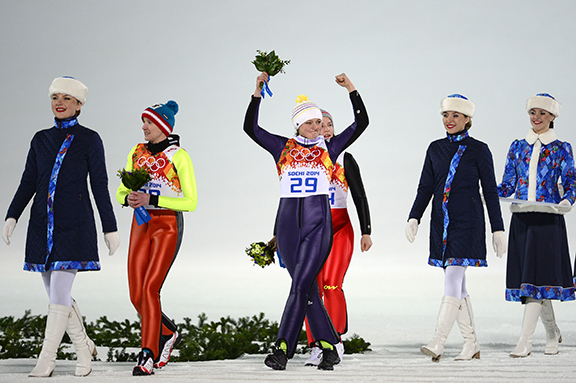 She is one of only a handful of athletes in Sochi who are openly gay. When asked by Russia’s R-Sports whether she supported protests at the Olympics against Russia’s anti-LGBT laws, she answered no. “No one cares,” she said. She didn’t have “any problems” in Russia or Austria. “Ten years ago it was different.” Ten years ago, Iraschko-Stolz was older than Takanashi is now, older than Hendrickson. Ten years is not a long time. She jumped pretty good. On her second of two jumps, she flew 104.5 meters. “Massive!” the commentator cried. 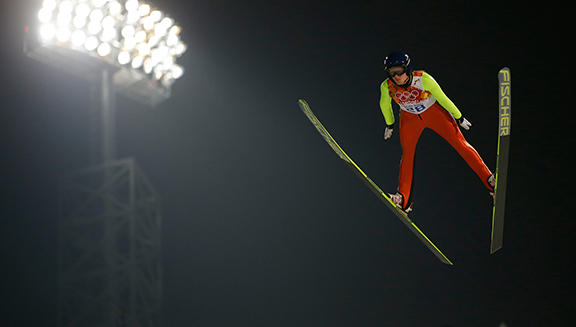 The gold medalist in the men’s normal hill competition, Kamil Stoch, had jumps of 103.5 meters and 105.5. But Iraschko-Stolz’s first jump had been short. She had a lot of ground to make up to catch the leader, Carina Vogt of Germany. And so she had to wait to see where she would place. As the leader after the first jump, Vogt went last. She came into the Olympics far behind Takanashi in the World Cup standings. She is 22 years old and has never won a World Cup event. She is trained as a police officer. Vogt had flown 103 meters on her first jump. Her second jump was shorter. But jumpers are scored not only on their distance but also on their style and form. They have to look good. Vogt almost quivered as she waited for her second score to be calculated. When it was announced, when she knew she had won, she burst into tears and fell to her knees. Progress, the way we usually use the word, is probably an illusion. The movement of history is the movement of time, and time is like gravity. Gravity doesn’t care who you are or what you’ve done. Still, there is a brief moment right after the ski jumpers leave the ramp when they seem to hang in the air. They don’t seem to be falling. They don’t seem subject to any force but their own. I had not expected this, but when I saw Vogt fall to her knees, the first winner, I felt myself shake.